PNC Park is the site of the matchup between the Cincinnati Reds and the Pittsburgh Pirates on Saturday, September 2, 2017. The probable starting pitchers are Tyler Mahle for the Reds and Jameson Taillon for the Pirates. Cincinnati opens at +151 while Pittsburgh opens at -161. The Reds have a 73-57-4 over/under record and a 68-66-0 run line mark. The Pirates are 69-65-0 against the run line and have a 55-74-5 over/under record. The Reds have a 57-77 overall record this season. Starting pitcher Tyler Mahle has a 0-1 record with an earned run average of 5.40 and a WHIP of 1.60. He has 5 strikeouts over his 5 innings pitched and he's given up 4 hits. He allows 7.2 hits per 9 innings and he has a FIP of 4.13. The bullpen has an earned run average of 4.57 and they have given up 486 base hits on the year. Teams are hitting .247 against the bullpen and they've struck out 509 hitters and walked 220 batters. As a team, Cincinnati allows 9.3 hits per nine innings while striking out 8.3 batters per nine innings. They are 30th in the league in team earned run average at 5.31. The Reds pitchers collectively have given up 1,225 base hits and 701 earned runs. They have allowed 215 home runs this season, ranking them 1st in the league. Cincinnati as a pitching staff has walked 514 batters and struck out 1,091. They have walked 3.9 men per 9 innings while striking out 8.3 per 9. They have a team WHIP of 1.46 and their FIP as a unit is 5.11. As a team Cincinnati is hitting .255, good for 17th in the league. The Reds hold a .440 team slugging percentage and an on-base percentage of .332, which is good for 11th in baseball. They rank 15th in MLB with 8.7 hits per game. 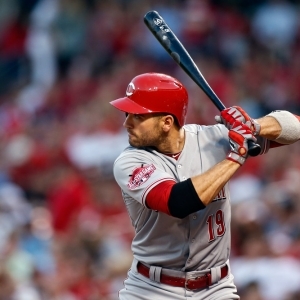 Joey Votto is hitting .310 with an on-base percentage of .448. He has 144 hits this season in 464 at bats with 91 runs batted in. He has a slugging percentage of .591 and an OPS+ of 168. Adam Duvall is hitting .252 this year and he has an on-base percentage of .305. He has totaled 127 hits and he has driven in 89 men in 503 at bats. His OPS+ is 108 while his slugging percentage is at .513. The Reds have 1,166 hits, including 209 doubles and 191 home runs. Cincinnati has walked 481 times so far this season and they have struck out 1,081 times as a unit. They have left 958 men on base and have a team OPS of .773. They score 4.8 runs per contest and have scored a total of 643 runs this year. Pittsburgh has a 63-71 overall mark this year. With an earned run average of 4.75, Jameson Taillon has a 7-5 record and a 1.56 WHIP. He has 103 strikeouts over the 106 innings he's pitched. He's also given up 124 hits. He allows 10.5 hits per nine innings and his FIP stands at 3.56. The bullpen has an earned run average of 4.10 and they have given up 444 base hits on the year. Teams are hitting .251 against the Pirates bullpen. Their relievers have struck out 411 batters and walked 169 opposing hitters. As a team, Pittsburgh allows 9.4 hits per nine innings while striking out 7.8 batters per nine innings. They are 13th in the league in team earned run average at 4.35. The Pirates pitchers as a team have surrendered 1,246 base knocks and 580 earned runs this season. They have given up 156 home runs this year, which ranks 23rd in Major League Baseball. Pittsburgh as a staff has walked 405 hitters and struck out 1,034 batters. They give up a walk 3 times per 9 innings while they strike out 7.8 per 9. Their team WHIP is 1.38 while their FIP as a staff is 4.24. As a team, they are batting .244, good for 27th in the league. The Pirates hold a .388 team slugging percentage and an on-base percentage of .320, which is good for 19th in baseball. They rank 25th in MLB with 8.3 hits per contest. Andrew McCutchen comes into this matchup batting .277 with an OBP of .368. He has 130 hits this year along with 74 RBI in 469 AB's. He maintains a slugging percentage of .482 with an OPS+ of 121. Josh Harrison is hitting .273 this season and he has an OBP of .340. He has collected 131 hits in 480 at bats while driving in 47 runs. He has an OPS+ of 101 and a slugging percentage of .433. The Pirates as a unit have 1,109 base hits, including 207 doubles and 129 homers. Pittsburgh has walked 442 times this year and they have struck out on 981 occasions. They have had 949 men left on base and have an OPS of .708. They have scored 4.18 runs per game and totaled 560 runs this season. Who will win tonight's Reds/Pirates MLB game against the spread?